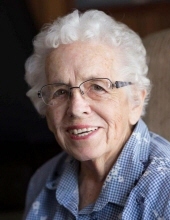 Norma C. Buckley, age 92 of Elma, IA passed away on Wednesday, April 10, 2019 at Regional Health Services of Howard County in Cresco, IA. Mass of Christian Burial will be held at 11:00 AM, Saturday, April 13, 2019 at Our Lady of Lourdes Catholic Church in Lourdes, IA with Father Jerry Kopacek celebrating the mass. Visitation for Norma will be held from 9:00-11:00 AM at the church on Saturday. Burial will be at Our Lady of Lourdes Cemetery. Online condolences may be left at www.conway-markhamfh.com. In lieu of flowers, memorials may be directed to the family. Norma Clara was born February 2, 1927 to Charles Sr. and Clara (Knippling) Boyle on the family farm near Elma, IA. She attended country school and graduated from Immaculate Conception School in Elma. On June 27, 1944, Norma was united in marriage to Garland Buckley at Immaculate Conception Church. Together, the couple farmed in the Elma area all of their married years. After Garland’s death, Norma remained on the farm. Norma was a member of Our Lady of Lourdes Catholic Church, Pro Life supporter, and “Our Evening Out” through Howard County Extension Office. She enjoyed gardening, bird watching, farming and conservation. She had an artistic flair for sewing, crocheting, and quilting. Her dog, Oskar, was her faithful companion in her later years. Her family was her pride and joy! Norma will be deeply missed by her children, Thomas (Kathryn) Buckley of Elma, Patricia (Paul) Hibbs of La Crosse, WI, Jane (Jim) Wood of Eldora, IA and Paul Buckley of Elma; her grandchildren, Amy Buckley, Chad (Shelley) Buckley, Todd Buckley, Andrea Hall, Andrew (Lindsey) Hibbs; her great grandchildren, Miranda Buckley, Annalise Hall, Mason and Hallie Hibbs; her sister, Judy (Ron) Hillsman of Waterloo, IA; brother, John (Ardel) Boyle of Elma; sisters-in-law, Barb Boyle of New Hampton and Hazel Boyle of Elma; in-laws, Clarence Meuterthies of Lawler, Leigh (Oliver) Gunderson of Alta Vista, and Dale Meirick, also of Alta Vista; her best pal, Oskar Otto Buckley and numerous nieces and nephews. She was preceded in death by her parents, husband, Garland; brothers, Patrick Boyle, Charles Boyle, Jr., and James Boyle; her sisters, Eleanor Hall, Bernice Heying, Marjorie Meirick and Madonna Mueterthies. To send flowers or a remembrance gift to the family of Norma C Buckley, please visit our Tribute Store. "Email Address" would like to share the life celebration of Norma C Buckley. Click on the "link" to go to share a favorite memory or leave a condolence message for the family.